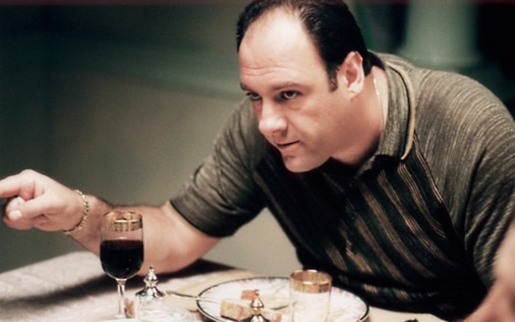 James Gandolfini as Tony Soprano, having a nice dinner. New Jersey’s most famous son played New Jersey’s most famous son. Born in Westwood and raised in Park Ridge, New Jersey, as the son of a first-generation Italian-American and an immigrant from Italy, James Gandolfini is a proud son of both the United States and a proud advocate of his Italian heritage. His parents spoke Italian at home and Gandolfini made frequent trips to Italy to reconnect with his roots. It is on one of these trips that Gandolfini suffered a fatal heart attack yesterday. James Gandolfini passed away from a heart attack at age 51. Gandolfini got his start on Broadway, but he made his bones playing various hitmen and mob enforcers in a variety of projects. He was the vicious Virgil in True Romance, played other mobsters and killers in other projects, and grew to be his most famous in the HBO series The Sopranos playing the brilliant Tony Soprano. In the wake of that show’s ending, he did movies, went back to the stage, and produced documentaries with HBO.